Spring Features are now available! Now available for a limited time. Place your ToGo order online and pick up today. 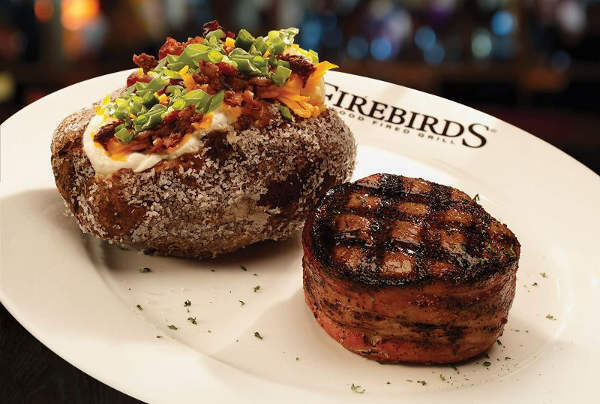 Firebirds Wood Fired Grill is located in West Des Moines just east of Jordan Creek Town Center next to The Courtyard by Marriott. We are an American Restaurant and Steakhouse known for our scratch kitchen, bold flavors and inviting atmosphere. Enjoy our signature menu items including hand-cut, aged steaks and fresh seafood or our specialty crafted cocktails and select wines. Join us for Happy Hour Monday thru Friday from 4-6:30PM at the FIREBAR ®or on the patio. We offer top-notch service and upscale dining at a modest price. Enjoy authentic wood-fired steak & seafood entrées, bold flavors, specialty cocktails & select wines in a polished-casual atmosphere offering top-notch service & upscale dining at a modest price. $$$ = $15 – $18 lunch | $28-$32 dinner. Average per person including entrée, drink, tax and tip. Call -- to place your order for pick-up. American Express, Cash, Discover, MasterCard, Visa. Just East of Jordan Creek Town Center next to The Courtyard by Marriott.